Itinerary Nomad. 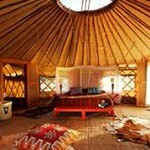 Shared seasonal camps Nomad Safaris. 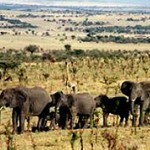 Shared mobile camps with private guide: Serengeti eco system. 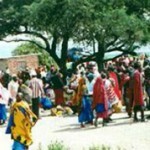 (2 guests) Tanzania, Flexible departures. This itinerary is more cost effective for two people travelling together compared to setting up a full mobile camp for two people. 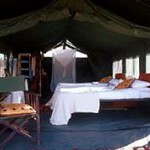 Shared mobile camps with the same safari operator Nomad safaris which are more comfortable. We have added in a night on arrival as well to break the journey more intersestingly. Flight: KQ101. Depart London, Heathrow terminal 4 at 1900 on Kenya Airways KQ101 overnight service to Nairobi. KQ6724 Connect with KQ6724 (operated by Precision Air) to Kilimanjaro at 0800 arriving 0850. On arrival at Kilimanjaro you are met by your guide with a land rover who then drives you south towards Manyara National Park. After about 1.5 hours you drive up towards the rift valley escarpment. The Maasai herd their cattle along side the road in clouds of dust. Lake Manyara shimmers to the left. Before starting the ascent, you may drop in to Lake Manyara National Park (Park fees extra) for a picnic lunch overlooking the hippo pools. Alternatively find another suitable stopping point close to the route. The entrance of the park is lush forest, fed by underground springs. Huge ever green trees provide a dark and luscious canopy, starkly different to the dry, natural terrain of the park. 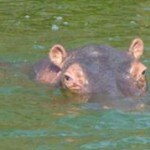 Depending on the depth of the Lake, the hippo pools are bursting with grunting and snorting hippo, competing for space with yellow billed storks and pelicans trawling the water for huge cat fish. After lunch, climb 2,000 feet up the rift valley escarpment. The views down over the lake are spectacular. Levelling out you hit the red, rich earth of Karatu. You turn off the main road up to your first destination. Plantation Lodge is a small and comfortable lodge set at the foot of the Ngorongoro Highland Forest Reserve. It is set next to a farm, first established in 1927 and now produces coffee and flower seeds as well as traditional corn crops. The 18 rooms are individually designed within a variety of different cottages in the beautiful gardens. (Four rooms are in the main house) Frangipani trees dominate and fill the evening air with their beautiful fragrance. All rooms have ensuite bathrooms with modern plumbing and comfortable Zanzibari beds with mosquito nets and are filled with a wealth of local Tanzanian water colours and artwork. The food must rate amongst the best in Tanzania and incorporates vegetable and dairy produce brought fresh from the farm. There is a swimming pool with a good-sized sitting out area that overlooks the surrounding farmland and a tennis court is due to be completed soon. As well as great walking opportunities on the farm and along the forest edge, there is easy access to Ngorongoro Crater, Lake Eyasi and Lake Manyara. Two nights on a full board basis. Drinks extra. The great advantage of the itinerary is that you will have the same guide through out your safari with your own vehicle.Therefore all aspects of your stay are flexible and you can be sure of expert and knowledgeable guiding. Picnic lunches and sundowner stocks will travel with you in the vehicle! Driving time to the Crater is 30 minutes on tarmac. 25 minutes to Lake Manyara gate. After a drive through the crater it is time to head North towards the great plains of the Serengeti National Park. Very approximately 4 hours drive to the Camp but with game viewing on the way and a Picnic lunch. 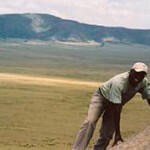 After coming out of the crater you drop down off the Ngorongoro highlands onto the Serengeti plains. This drive is one of the most soul soaring drives in Africa. The vastness of the grass plains entices and beckons you on. The horizon is so far away. The usually imposing Gol Mountains look like a bump. You just see unadulterated Africa. You should start seeing game immediately. Ostrich strut around, thick necked Kori bustards stride over the grass. Secretary birds daintily pick their way across the plains. Golden hassocks of grass turn into a Thomsons gazelle or a Grant. Secret dips reveal hyena dens or the ears of a bat eared fox. A cheetah lazily stands up and stares at you with golden eyes then stretches and wanders off, an image of pent up power and muscle. Great golden maned lions sleep in the sun. Serval cats with their radar ears leap at their prey. The sheer size and beauty of the skies, the clarity of the light, the power of the storms all make the Serengeti a truly magical place to be. This world famous area of 14,500 sq Kms hosts the largest concentration of wildlife in Africa. The landscape is diverse: From the vast central plains stretching as far as the eye can see, dotted with acacia trees to magnificent kopjes; riverine bush along the rivers and streams; small lakes and the odd swamp. Predators abound but the Serengeti holds our intense interest for the extraordinary annual migration of Zebra and Wildebeest. At this time of year the migratory herds should be at the southern reaches of the Park where your Traditional Mobile Tented camp will have been set up. During your time here, there will be ample scope for a variety of activities including traditional game drives, walking, picnics and some good sundowner spots. You may also visit the Gol mountains, Maswa woodlands and other remoter corners of this area as conditions permit. The ‘Meru’ sleeping tents are completely enclosed, 8ft high with 14x10ft floor area and contain full-size metal beds (complete with high-density mattresses and the finest blankets & linens), dressing tables, a safari wardrobe, luggage racks and safari chairs. They each have rechargeable lights as well as a number of traditional hurricane lamps. At the front there is a large verandah with a table and safari chairs whilst attached to the back is an en-suite bathroom incorporating a private ‘short-drop’ toilet and bucket shower cubicle. Hot water is available day and night on demand. There is a daily laundry service (weather permitting). There is a large dining tent with a shaded ‘sitting out’ area. As well as a fully-stocked bar and a cool box with cold beers and ice, there is a small reference library of African books as well as a selection of games. The cuisine is of the highest standard with innovative menus using freshly supplied fruit & vegetables all on the best china & glassware with picnics, buffets and barbecues giving variety. Three course candlelit dinners are served in the dining tent or under the stars with fine wines and liqueurs for accompaniment. Three nights on a full board basis. Drinks included (except Champagne). The camp may have other guests in under the same company but the maximum number will be eight and is quite likely to be less. (You retain your own private vehicle and guide for all excursions) Nomad shared mobile: tent interior. Serengeti plains. Our mobile safari operator has recently secured concession rights over a hirtherto untouched section of game controlled area east of the Serengeti. This means we now have access to some real wilderness areas away from any other tourist activity on the Northern circuit. You drive across the Serengeti eco system to Loliondo which takes a good 4- 5 hours but is a scenic game drive in effect. During the period December to March there should be ample game activity here as long as there is some rain to encourage fresh grass and so attract the wildebeest to these southern sectors of the serengti eco system. This region known as the Piaya community area measures some 60 by 20 kms. It comprises a unique combination of short grass plains, kopjes, acacia woodland, riverlines fringed with yellow fever acacias, dramatic hills and valleys as well as the Sanjan gorge that runs into the Salei plains towards Lake Natron and Oldonyo Lengai. Here, you will be able to enjoy game drives, walking safaris, picnics, sundowners and night drives. There will also be the opportunity for some close interaction with Maasai communities including visits to their bomas and ceremonies should any happen to be under way during your visit. Your accommodation will be as above. Three nights on a full board basis. Drinks included (except Champagne). The camp may have other guests in under the same company but the maximum number will be eight and is quite likely to be less. (You retain your own private vehicle and guide for all excursions). Today you are driven to Seronera airstrip for a scheduled service to Arusha at 1040 arriving 1200. Then you are met and driven to this lodge where a day room will have been reserved. 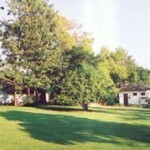 Rivertrees is a country-style, simple Guest Farm set in acres of tranquil gardens and farmland in a natural setting along the Usa River on the outskirts of Arusha. The verandah has a good view of Kilimanjaro. Conveniently situated midway between Arusha and Kilimanjaro airport it also has easy access to Arusha National Park. Tours of the local coffee plantations, walking and horse-riding can be arranged locally. The owners pride themselves on the warm hospitality and superb cuisine which contribute to the homely atmosphere for which Rivertrees has earned a reputation. The property has a swimming pool. There is a choice of accommodation: Standard rooms or “river suites” which are set apart and are very nice, roomy cottages with fire places. Day room with light supper included. 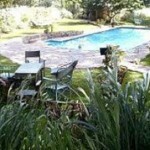 Option: Overnight stay and relax the next day in the hotel gardens and pool. Small extra supplement. Return flight as below. A return road transfer to Kilimanjaro airport for a scheduled flight on Precision Airways at 1940, arriving Nairobi at 2030. Days 9 to 10 Flight: KQ102. Connect with KQ102 at 2340 to London, Heathrow arriving the following morning at 0645. Economy class. Overnight on flight. Cost Includes: International and Internal flights as stated, airport departure taxes, all ground transfers, accommodation, drinks on board basis mentioned, park fees (subjext to government increase), conservation fees, activities as stated, Flying Doctor service. Tanzanian driver/guide. Cost Excludes: Travel insurance, tips and items of a personal nature. QUOTATION SUBJECT TO OUR BOOKING CONDITIONS AND AVAILABILITY. INSURANCE: It is essential that as soon as a booking is made that all passengers travelling are insured with comprehensive travel insurance covering medical, personal accident, liability and cancellation. Once booked cancellation fees are incurred should you decide or are no longer able to travel. Please ask us for details of our recommended insurance company.